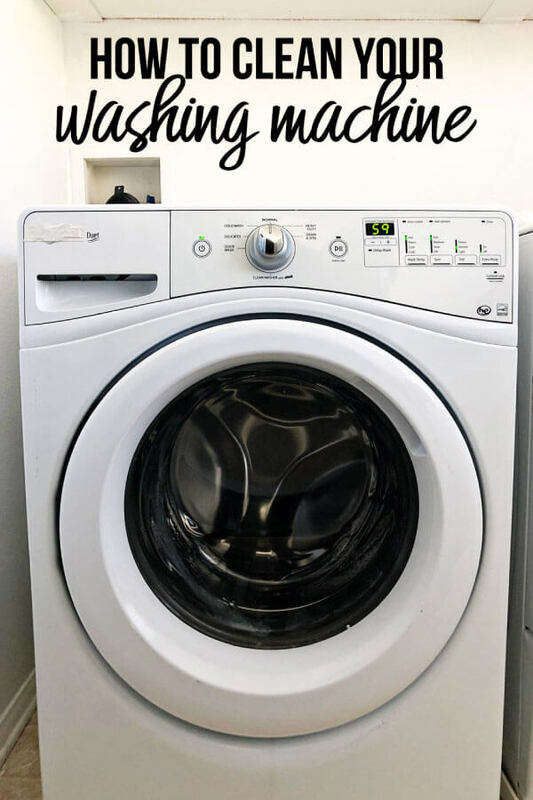 Learn how to clean washing machine with a few simple steps. 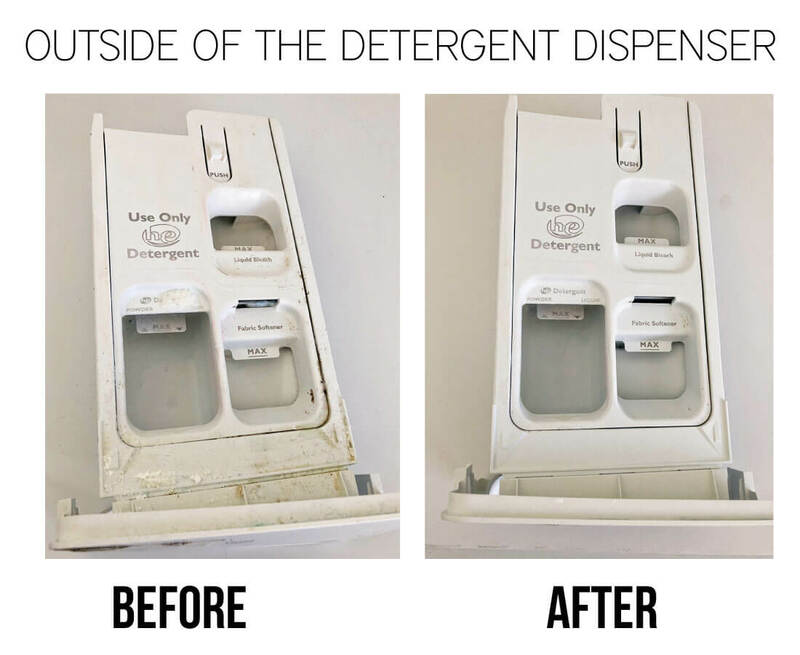 Not only will your machine smell cleaner, but your clothes will too! This post is in partnership with Carbona. I am thrilled to work with a company I believe in. Read below for further instructions. 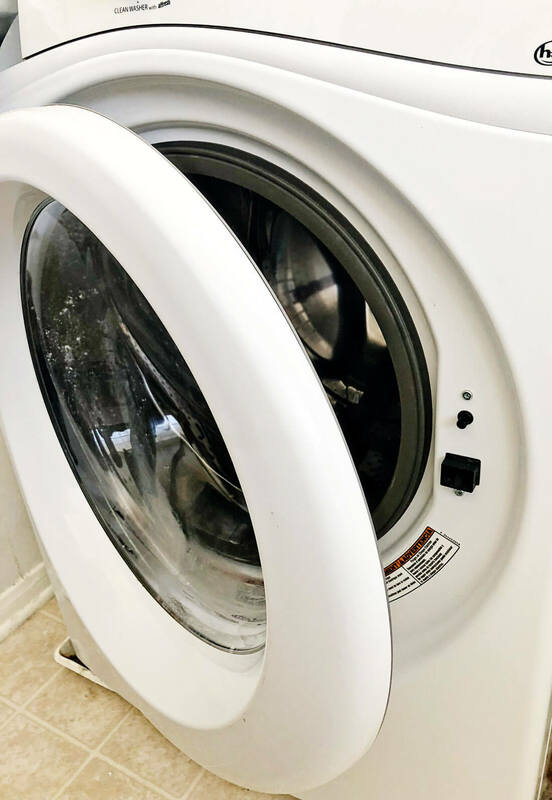 If you use your washing machine regularly (several times a week), you should be cleaning it at least once a month, or bi-weekly. Leave the washing machine door cracked in between washes so that it can air out and not build up mold and grime. There are a few washing machine cleaners on the market. 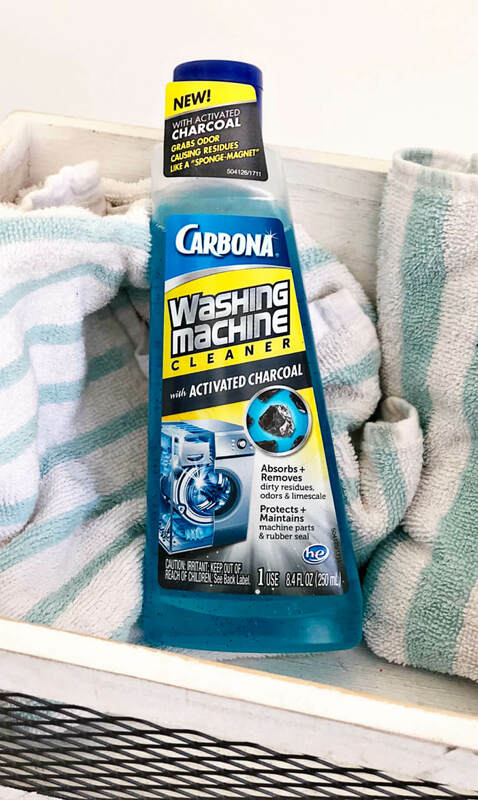 But this brand new Carbona Washing Machine Cleaner is the first of it’s kind to use activated charcoal. Don’t worry if you don’t know what activated charcoal does.. I didn’t either. 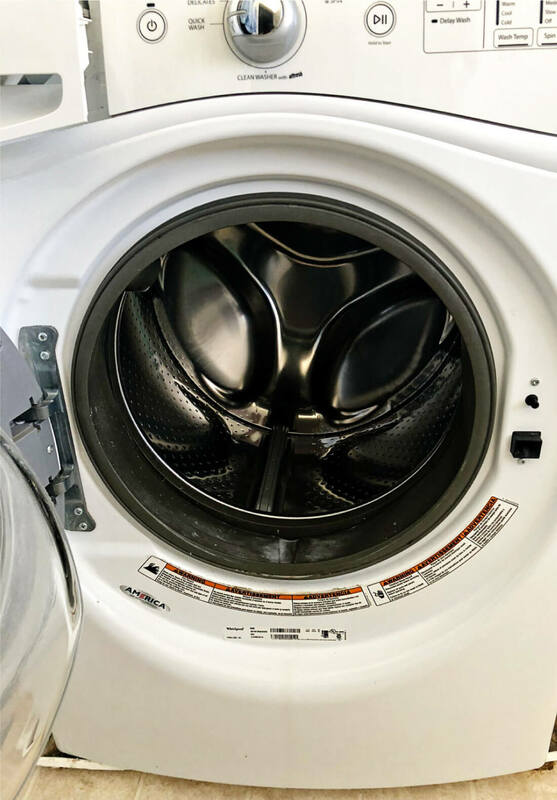 The main thing you need to know is that it attracts and binds odor-causing residues, dirt, and limescale – like a “sponge-magnet” – for a complete machine clean. And if you look at my before and after pictures below, you will see how well it does its job. 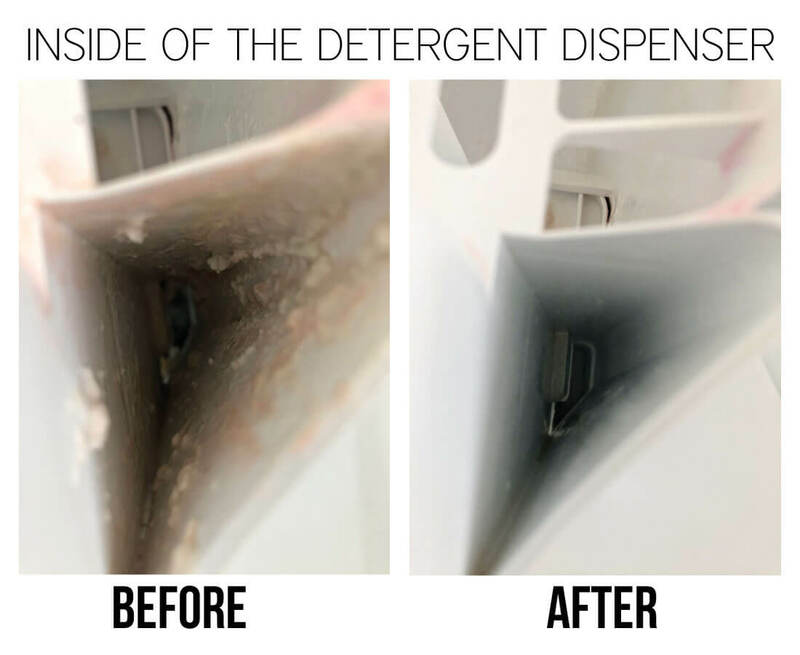 Take out the detergent dispenser to clean it well. 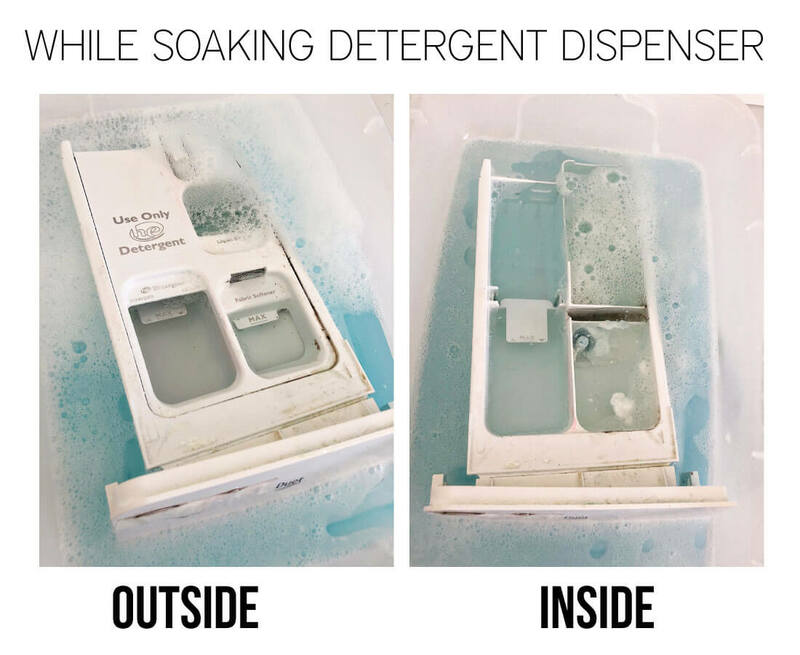 Soak detergent drawer with a solution of 1 oz. of Washing Machine Cleaner with 1 gallon of warm water. Then rinse off any residue and slide it back in place. Wipe down the inside of the door. Pour a small amount of Washing Machine Cleaner onto a clean cloth and wipe the rubber seal around the door, rinse thoroughly with a damp cloth. Using remaining Washing Machine Cleaner to rinse the machine down with a cycle. 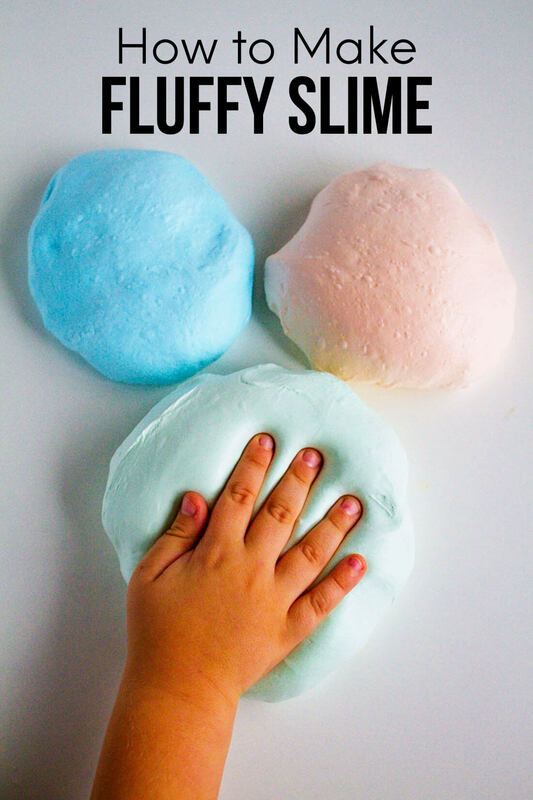 Pour the remaining amount leftover in the bottle into the detergent dispenser and run a normal cycle on hot to rinse everything down. 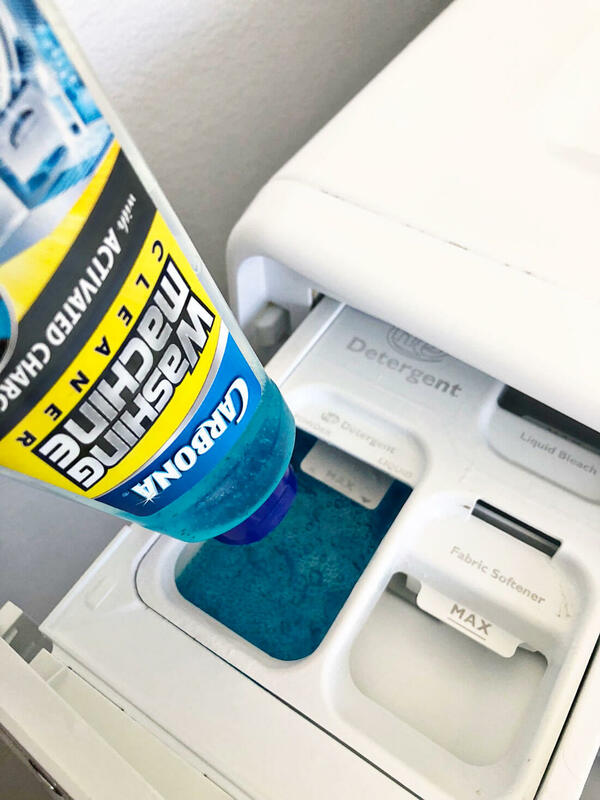 I knew that my detergent dispenser was bad but I had no idea HOW bad it was until I pulled it out and started cleaning it. Yuck! This is quite possibly the sickest gunk I’ve seen in a long time. No wonder why the drawer would clog and fill up with water after each use! I set a timer for 30 minutes to let Carbona Washing Machine Cleaner do the work. After the timer went off, I was amazed at how much grime and sludge came out of the drawer. And now you have a sparkly clean, fresh smelling washing machine! 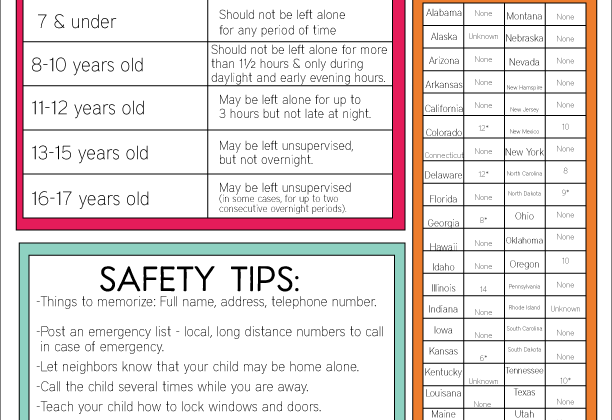 5 Laundry Systems That Work – Which One is Right for You? Where can you buy this? I’m in Arizona and wondered if there’s a store locally who sells it. Thanks! 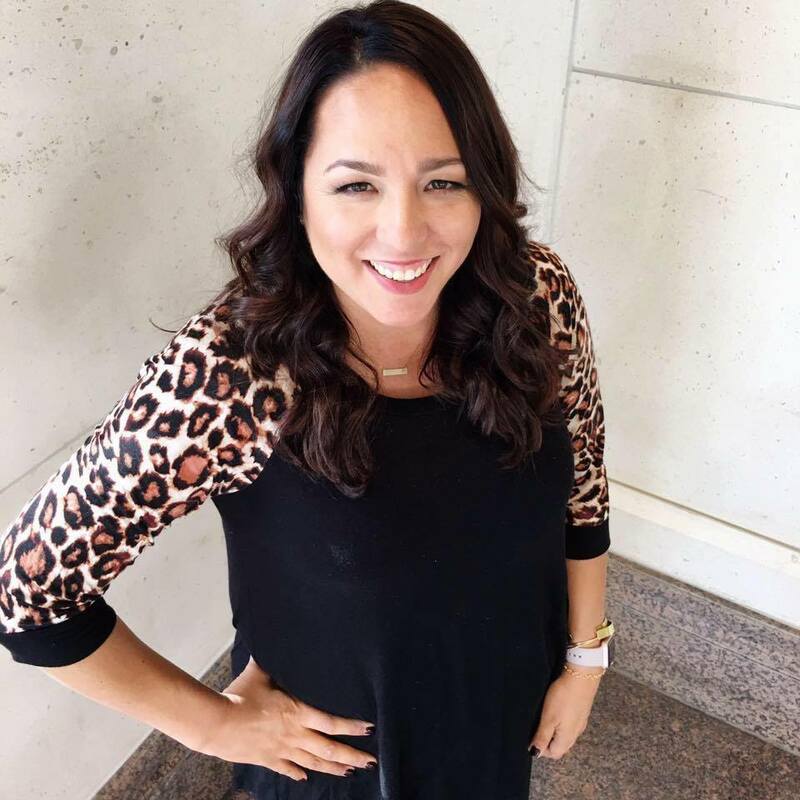 Hi Allie – they actually have a store locator on their site. But are at most Walmarts! I wish I had known this before my washing machine when out on me. I’v got to get it fix but the time is so hard to do. Thank you so much for your advice. 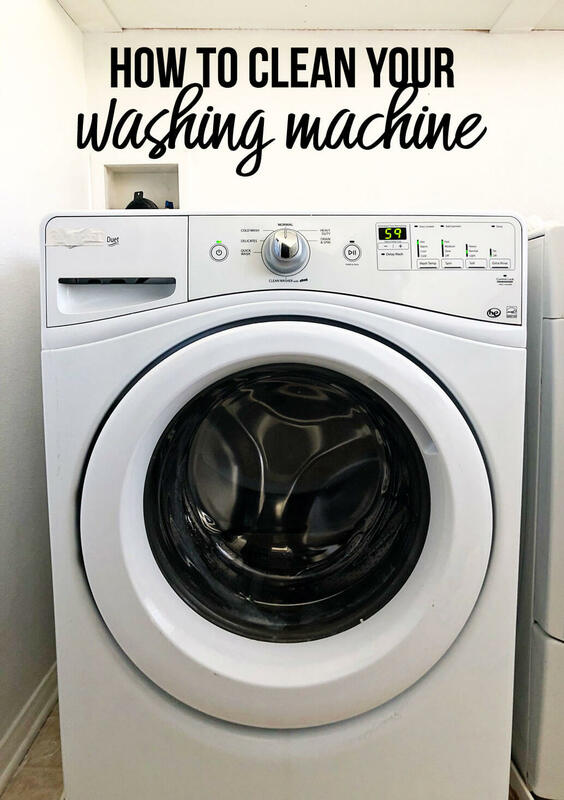 How do I clean a top loading washing machine? Is Carbona washing machine cleaner made for “top loading” machines too??? I have a top loading washer….just wondering….